Are you interested in promoting the products and activities of your organisation on the internet? Then advertising on Social Europe (SE) is the right option for you. SE offers limited advertising opportunities based on a combination of bespoke advertising boxes & banners as well as dedicated newsletter messages. The minimum advertising duration is one month and we offer discounts for longer-term campaigns. We also offer bespoke newsletter marketing for publishers and higher education institutions. Our advertising philosophy is based on tailor-made solutions to maximise added value for all stakeholders. It is our firm belief that the highest added value is created if advertising campaigns are carefully constructed in cooperation with our clients to match the content you wish to promote with what our readers find of greatest interest. This leads to better performing campaigns for clients and a better experience for readers as our advertisements deliver information of real interest to them. In short: we don’t advertise washing machines but only content and products related to the topical areas we cover. Working with Social Europe has allowed us to connect with an engaged audience that share the same interests as the books and ideas we promote. We have been impressed with the high level of engagement from the email campaigns we have run with Social Europe, and by the banner ads and opportunities to advertise on the newsletter – we look intend to working together going forward. 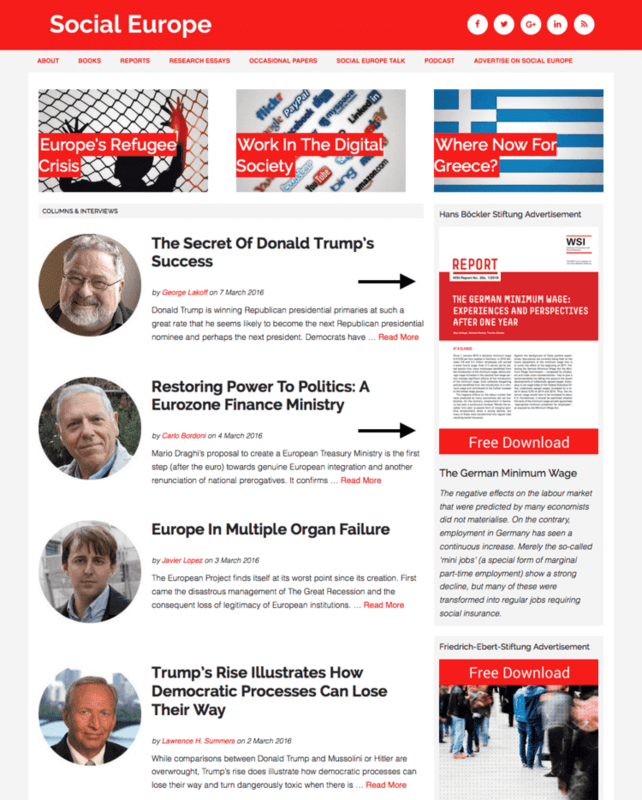 We were looking to reach out to a different audience for one of our programmes for executives and experimented with a message sent out to Social Europe’s database of subscribers. The results from this activity exceeded our expectation both in terms of volume and level of engagement. We are therefore planning to advertise through Social Europe again in the future and would heartily recommend them to other institutions. Our flagship advertising scheme is a limited number of bespoke SE advertising boxes & banners designed to promote freely downloadable publications or other pieces of information such as event announcements and specific landing pages. This scheme also includes dedicated emails via our newsletter. We also have a special scheme to advertise relevant books and other publications via our fast-growing newsletter. If you are a publisher interested in an advertising partnership for your publications please get in touch: we are here to help you. We have also had successful campaigns advertising higher education programmes in relevant areas and are very happy to discuss how we can help promote your programme. If you are interested in advertising on Social Europe please contact us at [email protected]. We offer bespoke partnerships and some of the best rates in the market. Please note that we only offer the advertising schemes set out above so please do not get in touch if you want to place text links or publish content written for clients.